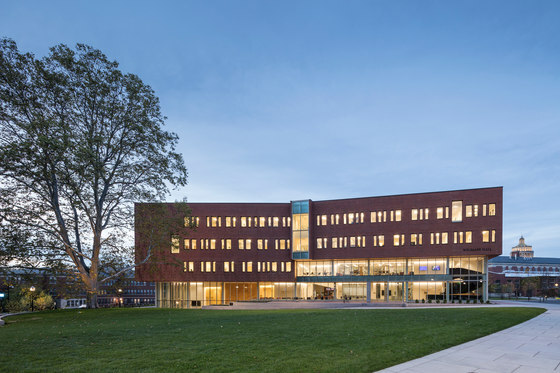 The new Institute of Data Science at the University of Rochester is the signature focus of the University of Rochester’s Strategic Plan to foreground information technology in a new educational model for cross-disciplinary research and innovation. 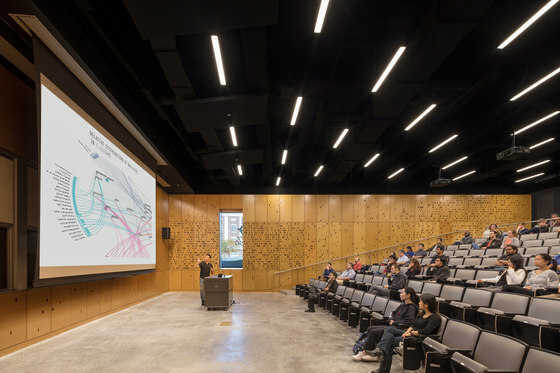 The 61,000 square foot building program includes smart classrooms and faculty offices, robotics, science, computation and environmental labs, a 160-seat auditorium, and the Goergen Institute, a new public resource for information technology. 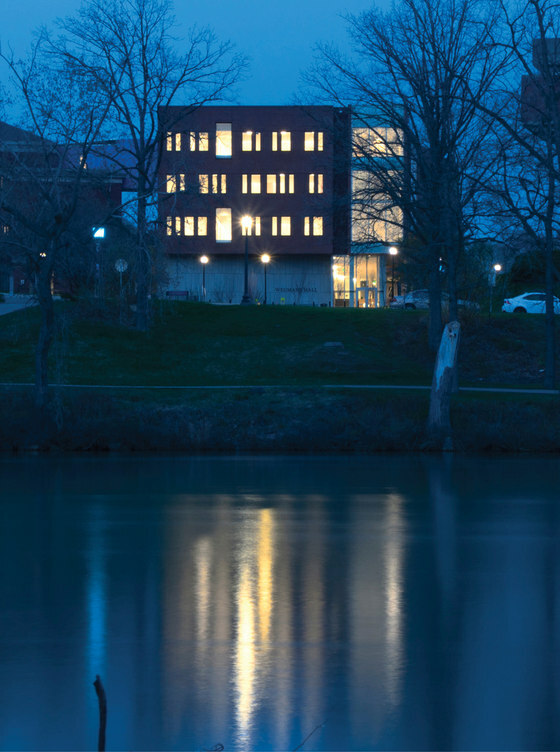 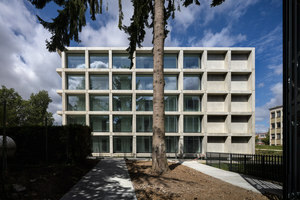 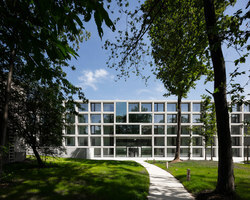 The massing of Institute of Data Science is created from a simple rectangular volume that is “broken” to unite two campus geometries: it offers a new public face to the Genesee River and completes the Science & Engineering Quadrangle, transforming the existing exterior vehicular roadways into a new, 2-acre pedestrian and bicycle-oriented campus landscape. 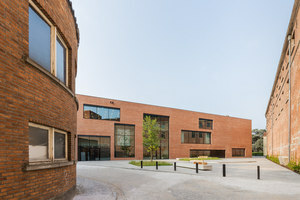 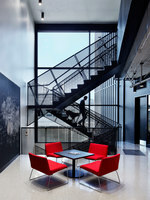 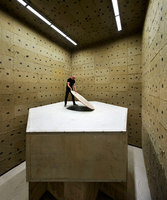 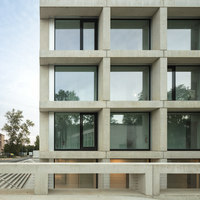 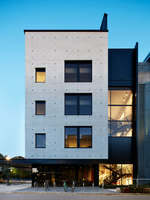 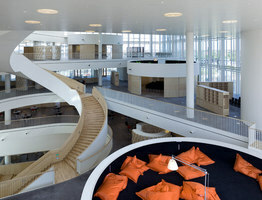 To meet the Data Sciences research mission, the design takes a different conceptual and constructive approach to brick. 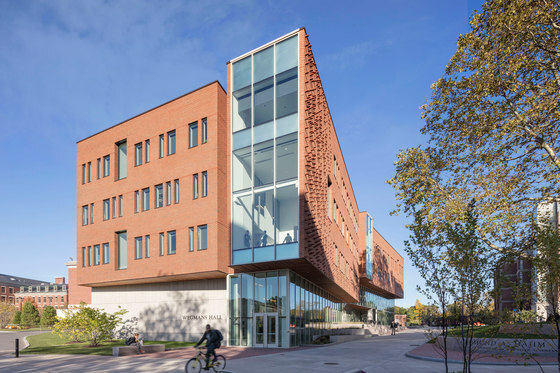 This project transforms the University’s standard red brick in a design that treats each brick as a digital “pixel” of information capable of expressing its status in relation to the building’s overall geometry in the campus context. 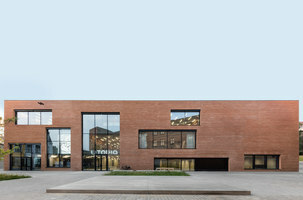 The taught brick skin is subdivided into running and Flemish bond patterns with projecting header bricks in the Flemish bond zones, designed using generative algorithms visualized in digital 3D modeling software. 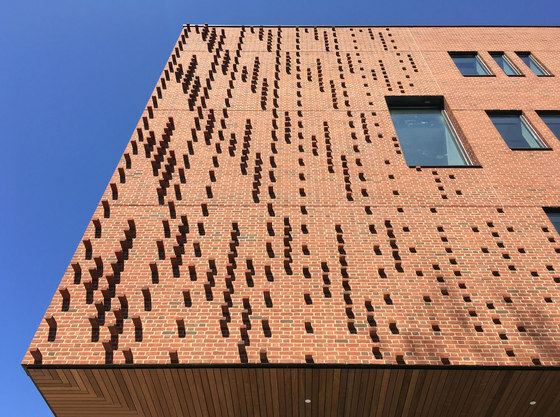 This creates “data streams” of textured brickwork which provide a reading of the massing’s inflections to the river and the campus. 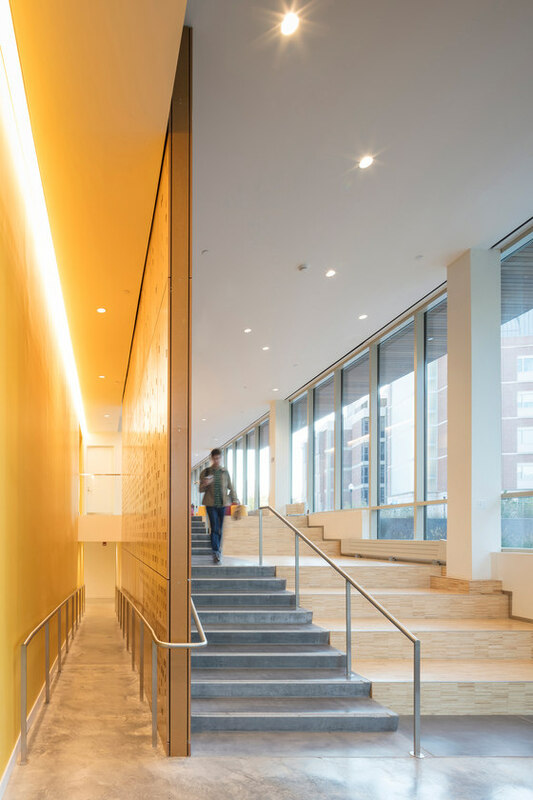 Shadows from the projecting bricks activate the façades, creating dynamic, textural surfaces that communicate natural environmental data across the days and seasons — information which is made legible at multiple scales across the building’s brick surfaces. 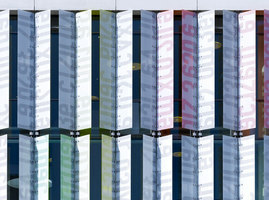 Narrow and wide punched windows are inspired by the binary 0 / 1 that is fundamental to encoding data. 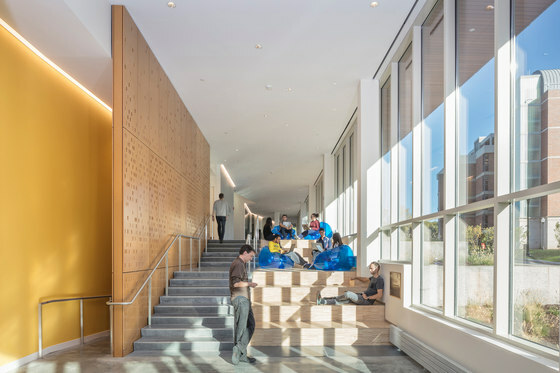 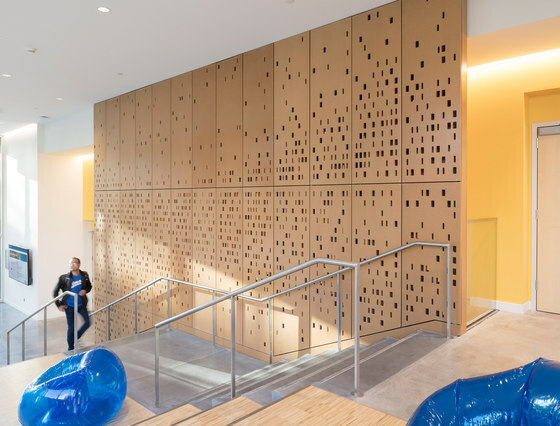 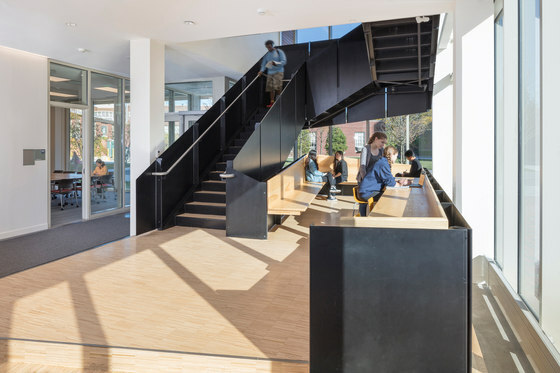 In the interior, social collaboration spaces are integrated into a generous public circulation sequence, which follows the building perimeter and engages each floor level with doubleheight collaboration zones with views to the Genesee River and the Science & Engineering Quad. 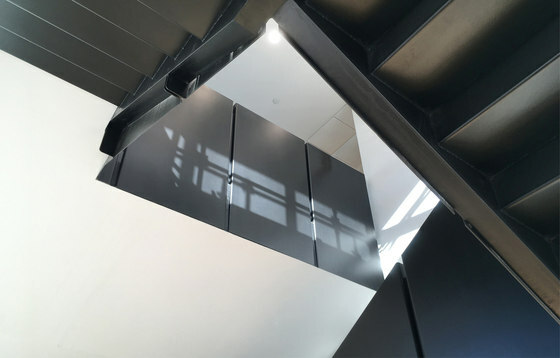 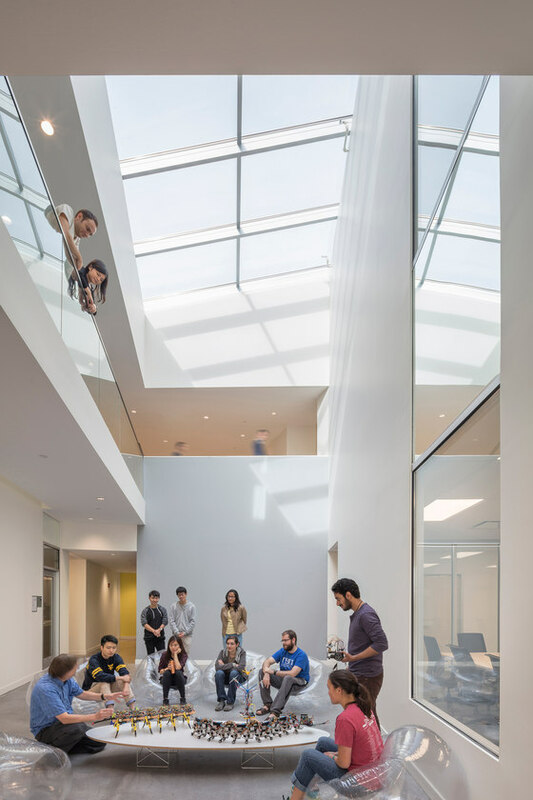 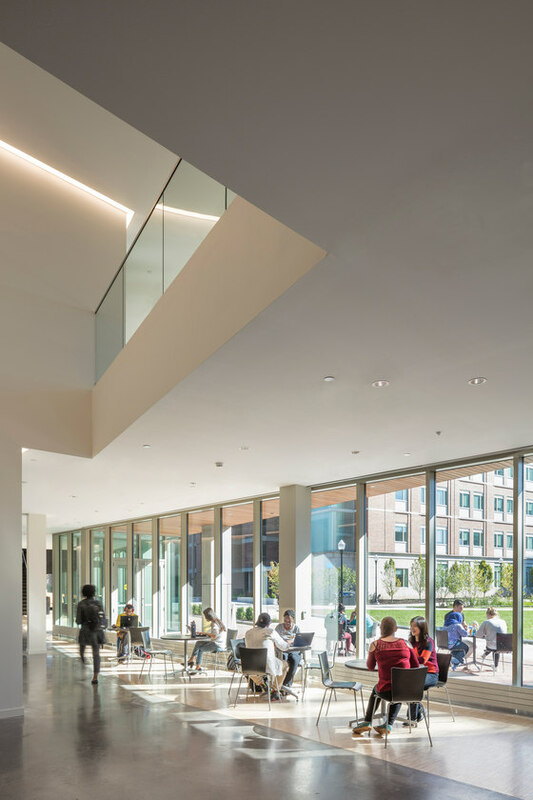 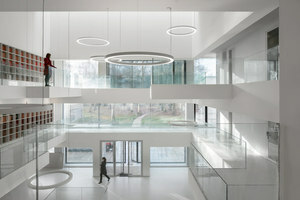 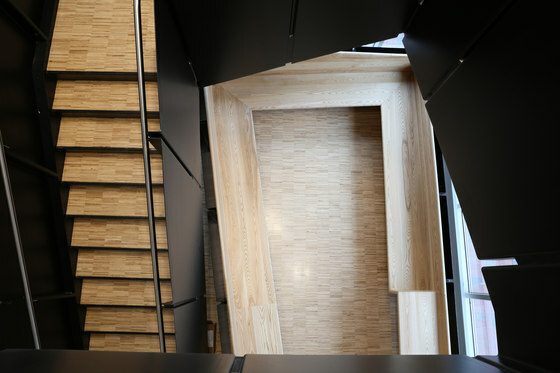 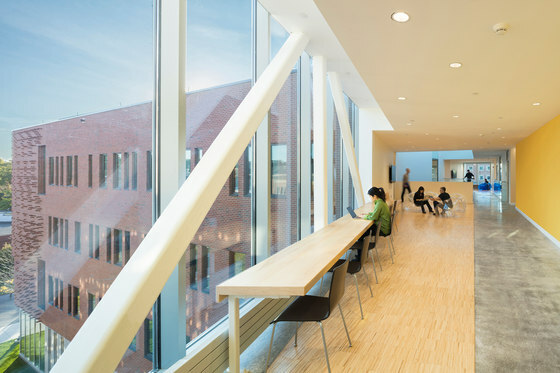 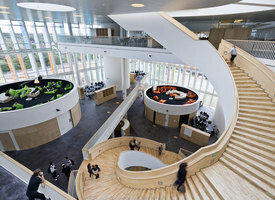 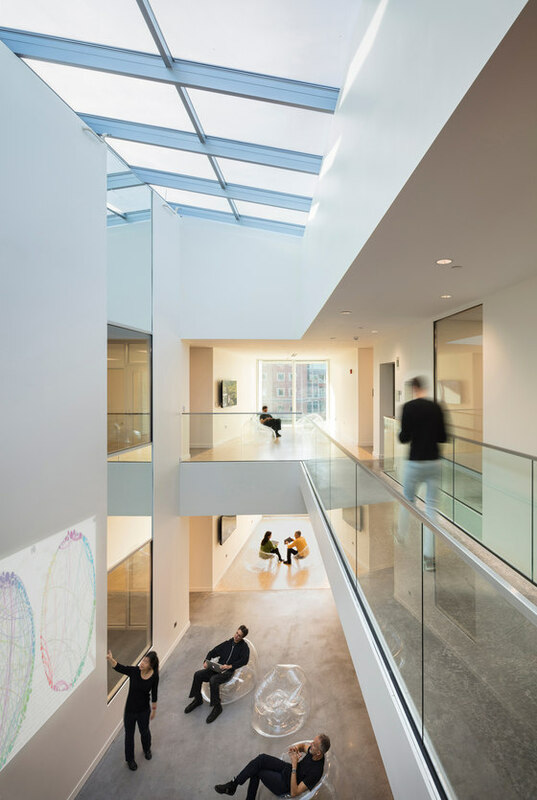 The sequence of collaboration space culminates at a double-height, shared lab space with skylights that overlook the Quad and is linked by a new bridge to neighboring Hopeman Hall. 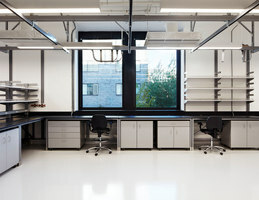 Lab spaces are designed adjacent to collaboration spaces, using a modular bay system which supports flexibility and interdisciplinary research projects. 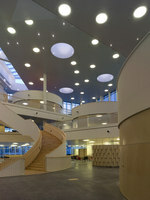 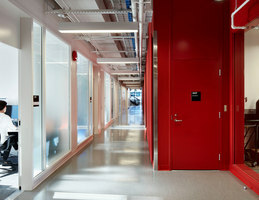 All interior lab corridors terminate with window overlooks which admit natural light deep into the building interior. 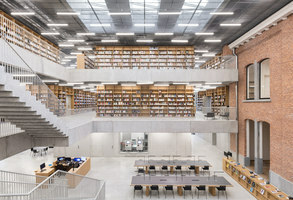 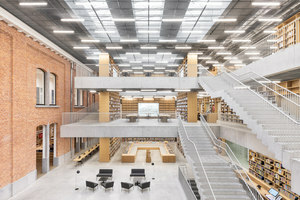 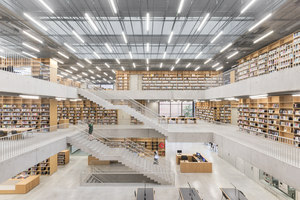 The public circulation sequence is expressed on the exterior facades, with large vertical glazed bays that “breakthrough” the brick envelope to reflect double-height collaboration zones, and shared overlooks that admit natural light deep into the building interior. 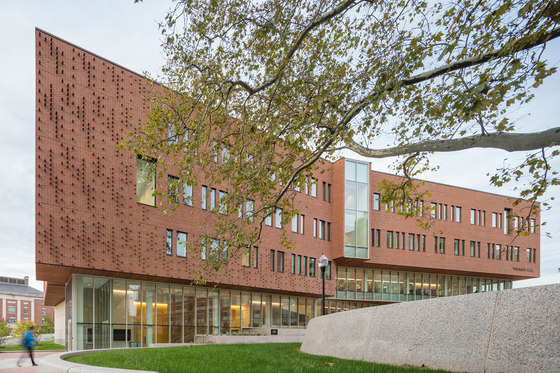 A double-height curtainwall on the first and second level interlocks with the figure of hung brick on the upper floors and expresses the Institute’s mission to create an open and collaborative research culture that engages the green space of the renewed Science & Engineering Quad.